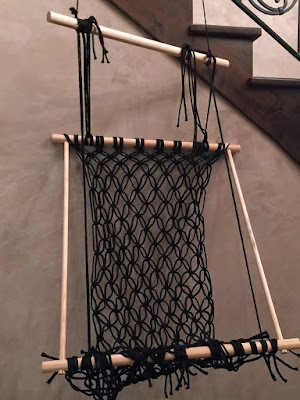 This week I thought it would be fun to celebrate summer with this fun DIY hammock. The original pin is here I would check it out, she does a way better explanation (and her pics are better too). 1) The instructions state to drill a 1/4" hole 3” from the end of each 1 1/4” dowel. I would do an 1/3" hole because I could not get the 1/2" rope anywhere near able to fit in the 1/4" hole. 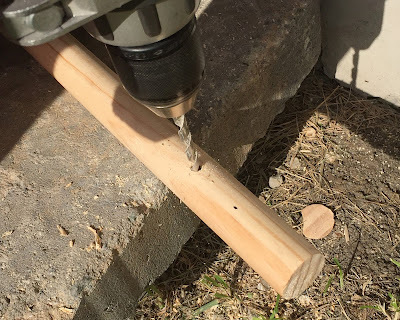 2) Drill a 5/8" hole 2” from each side of 2 of the 1 1/4” dowels. **TIP** When she said to make sure your holes are even, she isn’t kidding! We tried really hard to make ours even and it was still totally crooked. I would definitely measure out before you drill. 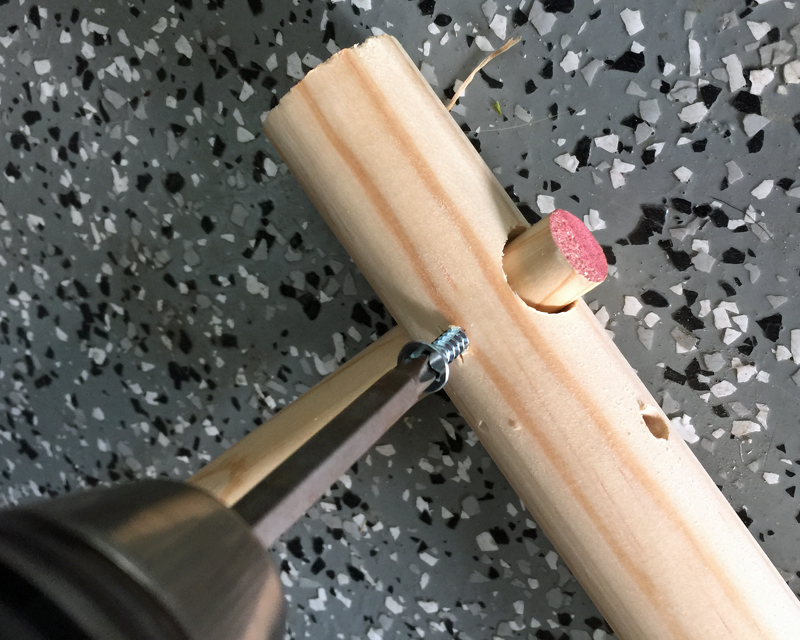 3) Put your 5/8” dowel in the 1 1/4” dowel (as shown) and use a wood screw to keep it in place. **TIP** Drill a small hole first before you put the screw in so the 5/8” dowel doesn’t crack. 5) Cut (16) 26 foot pieces of cord. 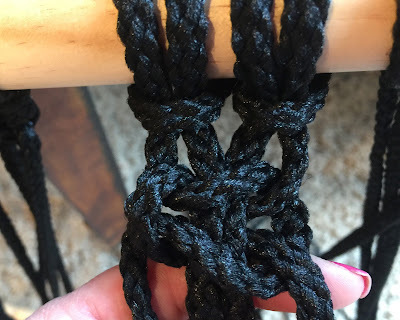 **TIP** To make the seat, you will basically be doing square knots. It can be pretty confusing and quite honestly, the more I looked at the pictures the more confused I got. Just repeat the directions I write in your head and pretty soon the pattern will be obvious to you! 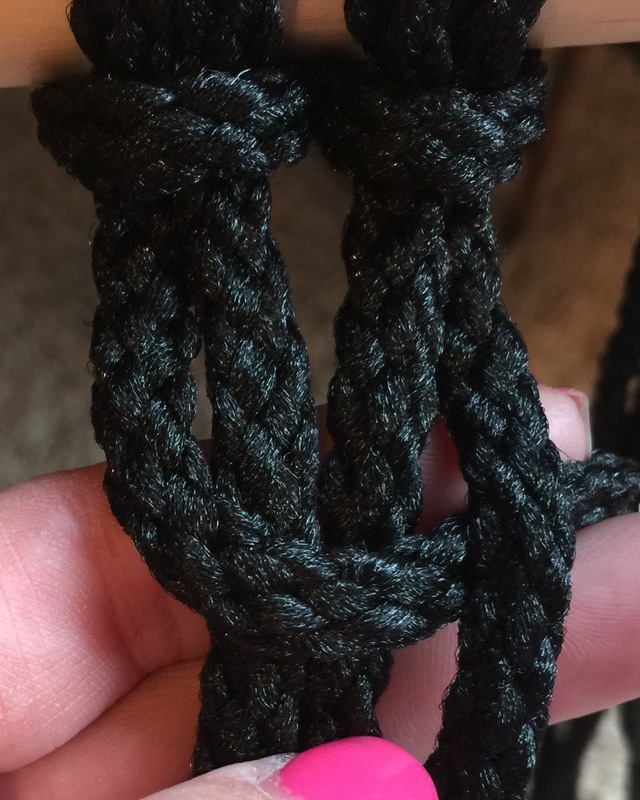 7) Starting with the first four cords, take the left cord and cross it over the center two, then under the right cord. 8) Take the right cord and cross it under the center two cords and up through the hole, passing over the left cord. 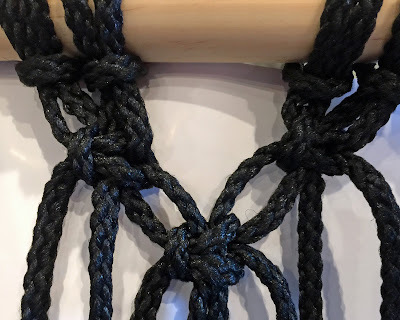 9) To complete the second half of the knot, you’ll do the same thing in reverse. Take the right cord and cross it over the center two, then under the left cord. Then take the left cord and cross it under the center two cords and up through the hole, passing over the right cord. 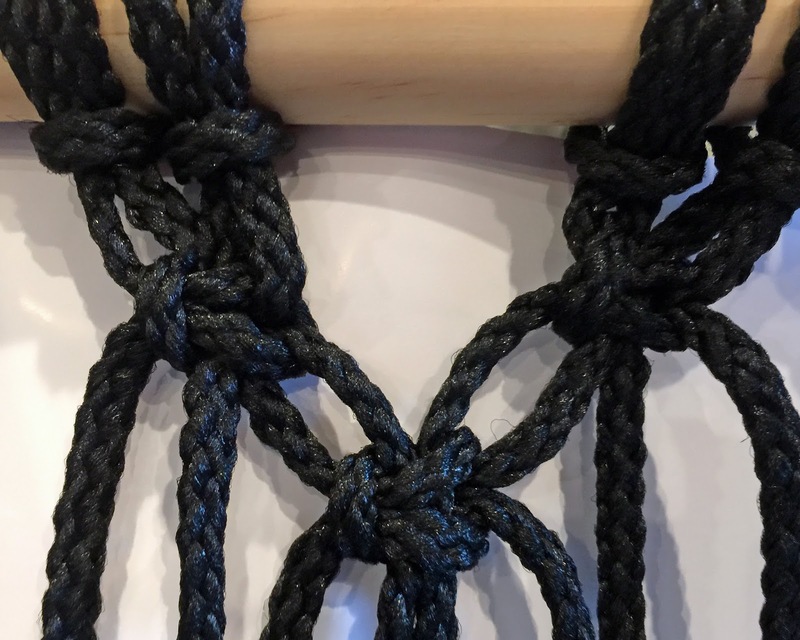 Pull the knot tight. Continue this with all the cords. 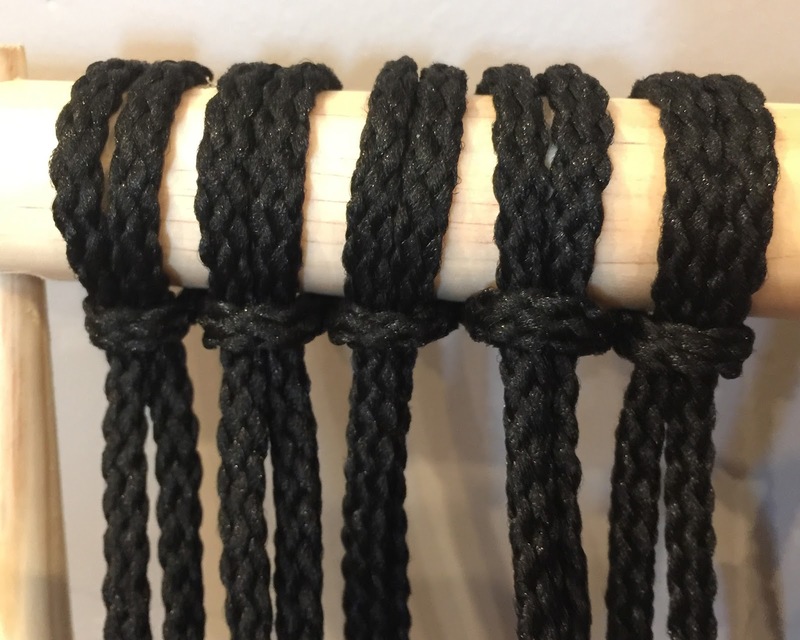 10) For the next row, you will do the exact same thing but start with the 3rd cord. 11) For the next row, you will go back to the first cord. 12) Continue until your seat is about 15 inches longer than your frame. 13) Tie the bottom to the bottom of the frame and trim your cords to your desired length. 15) Cut (2) 65” rope lengths. Thread through the bottom of the frame and then tie to the 3rd dowel (hanger). My opinion… not having the frame perfectly straight made my chair look a little ridiculous. 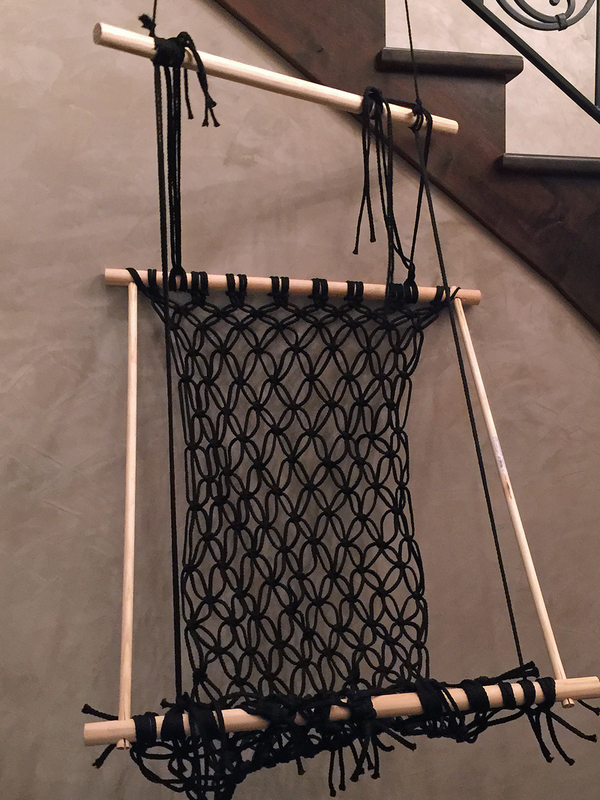 But, I did find the actual macrame fun and relaxing to do. And, the hammock was super comfortable. BUT, I was afraid to sit in it. Could be psychological but it didn’t feel super sturdy. This chair cost me about $25 for the cord, $18 in dowels, $5 in rope (total $48) plus 5 hours in time. I think I would have preferred to order this chair for $55 on Amazon. There were others for as low as $30. As much as I thought this was fun… I would call this a PINTEREST FAIL mostly for the time and cost. 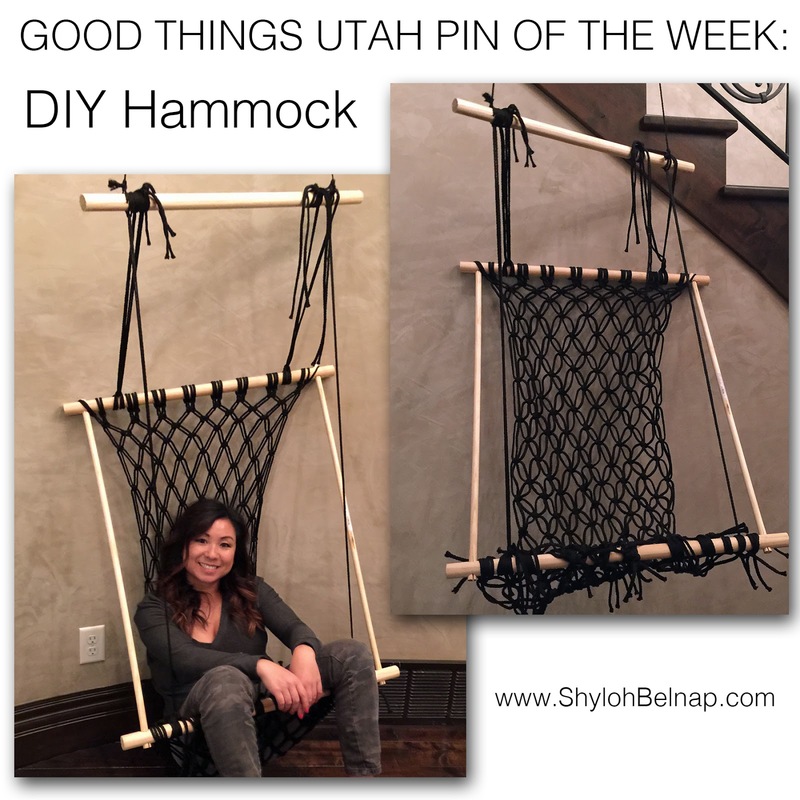 That's a very nice DIY hammock. But I think the overall costing you've spent is bit high. 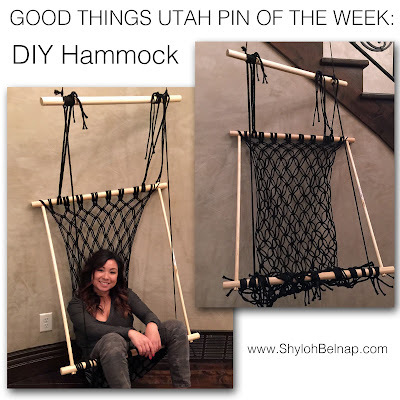 I like that hammock though and very much liked the last image photo you've shared. You may be able to buy it...but you MADE it by yourself. That's an accomplishment. I love to make things. I would make one myself if I had a place to use it. I think it is way more cool to be able to make one than to buy one.